For all the talk of intent and positivity, India’s planning against spin seems to be dominated by ego and the false sense of security. There is this thing about strengths, it leads to complacency, which in turn leads to jitters creeping in, and within a heartbeat, the same strength turns around to mock you as it becomes your biggest cynic. For Team India, playing spin was one such strength. Rubbery wrists, twinkle toes and the eye to decipher the spinning ball from the hands of the bowlers – it was second nature for the batsmen. We blinked, and now, it has become quite a problem. Yes, when the Indian team travels overseas there is all the talk about the seaming ball, about fast bowlers and the ability of the batsmen to counter the moving ball. Yet, in the recent past spin has become a huge problem area for India. It started back in 2012 when England arrived in India and Graeme Swann and Monty Panesar wrapped the entire batting unit in knots. England wrapped up the series, their first in India in 28 years and thus started a rather painful journey. When India went across to England, it was Moeen Ali who trundled up as a part-timer and bagged wickets as a pro. He repeated the feat again in Southampton this year as India surrendered the match and eventually the series. The team now eyes the Australian challenge. On pitches with bounce and zip, the troika of fast-bowlers in Mitchell Starc, Josh Hazlewood, and Pat Cummins will pose a threat. 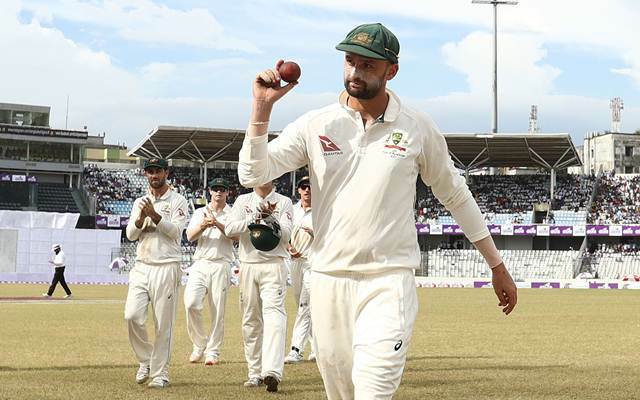 The narrative is around an Indian win, but as has been the case forever, we are not looking at a certain Nathan Lyon. Remember Adelaide 2014, Kohli’s twin centuries, a defiant partnership with Vijay, and then a collapse. Lyon and his shenanigans were just too much for the Indian team. Why then are we not talking about him? Let’s start. From the same venue where the first match will begin, the venue where he worked as a ground-staff and an occasional net-bowler, the venue where he bosses affairs now. He has 37 wickets from just seven matches (fifth highest overall at the venue) and has never gone wicket less in a single Test inning. The bounce at the Adelaide Oval and the scuffed up nature of the surface is his biggest ally. Ask the Indians, they will nod in unison. The offie has accounted for 15 batsmen five or more times in Tests. 5 of the batsmen on this list are from India. Virat Kohli, Cheteshwar Pujara and Ajinkya Rahane are on the list. India’s nucleus in the batting order has been dismissed five, six, and seven times respectively! Former Australia off-spinner Ashley Mallett predicts the series in India’s favour, but only when the visitors have a plan to ward off the threat of Nathan Lyon. “Look, it’s not that Lyon will bowl to an Indian line-up that includes VVS Laxman and Sachin Tendulkar. Those batsmen used their feet and thus changed the length. No one tries to change the length — not just India, all the teams’ batsmen,” he was as quoted by mid-day. It is such a revealing statement, a statement which should be pinned on the dressing room walls of the Indian team. For all the talk of intent and positivity, India’s planning against spin seems to be dominated by ego and the false sense of security. Numbers scream out a revealing picture, it’s all about gauging the connotations now. For when the failures are given a stern look and forced to surrender, it can be quite fickle. Perhaps, it might even become your strength!